A delicious wine – be it red, rosé or white – is simply part of a good meal for me. So I wanted to know exactly what a good wine recommendation with vegetable recipes or food with fruit could be. So I visited Joachim Buchholz from City and more in Sinzheim/Baden to get a few tips on this topic from a wine expert. Nice that you have time for me. Something that has always interested me: why do you read so little, if anything at all, about wine recommendations to accompany fruit and vegetables? The main focus is always on fish or meat, although in modern cuisine, a healthy and tasty diet with vegetables and fruit is playing an increasingly important role. That’s true, that’s the current rule. Basically, wine and fruit or vegetables go together. But preparation is very decisive. Particularly in the case of vegetables, when selecting the wine, one must pay particular attention to the accompanying ingredients of the food and the spices used. These things determine whether the wine fits the respective recipe or not. The cooking method of vegetables also plays a decisive role: whether boiled, steamed, fried, stewed or grilled, vegetables always show different their facets. It is difficult to combine some raw vegetable varieties with wine. For example, artichokes or spinach contain raw bittering substances, which intensify combined with wine in the mouth. 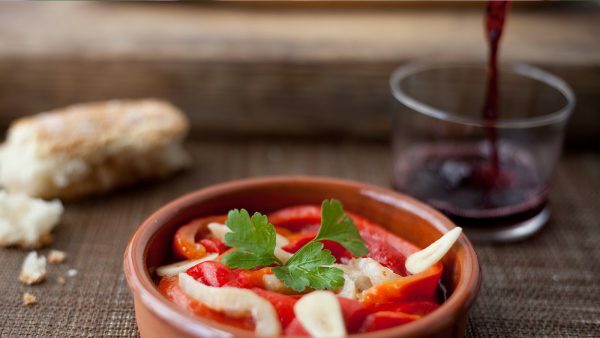 A tomato salad or tomatoes with Mozzarella have a rather sharp acidy, which should not be combined with young, sparkling and acid-accented wines such as Veltliner or Riesling. I therefore always recommend enjoying a salad or vegetables with bitter substances raw and without wine. If, however, a salad with fish, meat or other additions, such as potatoes or lentils is served, then the wine can again be well matched to the respective side dish. I love raw vegetables, like all radish varieties, which I enjoy with a cool beer. Sure, in a Bavarian beer garden, that’s super delicious … But tell me, there are certainly also ideal partnerships of vine varieties and fruits or vegetables. For example, for asparagus …. You are right! White asparagus just loves the Silvaner and is also very good with a Weißburgunder (Pinot Blanc). If you enjoy green asparagus, it’ll be exciting all over. Green asparagus also goes well with dark meat, such as lamb or beef. A red wine, like Merlot or Cabernet Sauvignon, goes much better with this. Sauerkraut tastes very good with an Alsace Riesling, which is rather a bit more opulent. If the recipe itself is acid-stabilized by lemon or vinegar, choose a wine with less of an acid accent, such as a Grauburgunder/Pinot Grigio or Chardonnay, and less fresh, young wines. For the Asian vegetable cuisine with ginger and the typical spices, a Vin Gris or Blanc de Noir go very well. But what generally applies: in the wine selection, vegetables should rather be neutral. The other ingredients of the meal determine the wine selection. However, you should pay close attention to the acid and bitter substances in the case of raw vegetables, otherwise neither the wine nor the vegetables will taste good at all. So you can’t assume that a wine with vegetable wine aromas, such as green peppers will automatically match the vegetable of the same name. How about in the case of fruit desserts and wine? Fresh, tasty fruit does not need wine. The taste of fruit by itself is the best. If you have a fruit salad and combine it with biscuits or a cream, yes, then again a white wine can be added: a Moscato, an Auslese or Spätlese. For exotic fruits such as pineapple or mango, I find a Verdello from Portugal – or in Spanish, Verdejo – great. A red tingling Brachetto from Piedmont goes perfectly with strawberry and rhubarb compote. Is it really true that fresh strawberries and fine champagne are an excellent match? Yes, but please choose rosé champagne. For cherry desserts, I also find a Edelbrand an exciting companion. But as with all tips and recommendations about wine, people have to simply like the taste, and therefore my best recommendation is: try it out and compare it. My advice: you should try regional wine recommendations with the typical regional dishes, because traditionally, you can make very delicious new discoveries, which have long grown and have long been tested. Joe, I getting extremely hungry and thirsty. And could now go for a delicious, cool white wine. I thank you for this great, culinary conversation. For 10 years now, Joachim Buchholz and Martina Buchholz have been “In Search of Enjoyment” with City and more. What was once just a hobby is now their raison d’être – for 10 years. It all began with the Internet guide for special addresses on the topic of pleasure: restaurants, hotels, producers and special shops. In the meantime, enjoyment events have been added, such as the annual Fine Food Fair, a wine and delicatessen store, a wine and delicatessen shop on the Internet as well as pleasure trips. Wie ist das eigentlich mit dem richtigen Wein zu Gemüse und Obst?